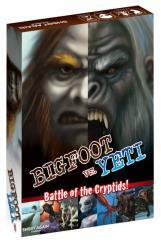 A battle is brewing between the undisputed king of the cryptids Bigfoot and his stone cold cousin the Yeti, who is sick of playing second fiddle. In Bigfoot vs. Yeti you are an up and coming cryptozoologist mounting expeditions in the hopes of proving the existence of unknown creatures such as Bigfoot, Yeti, The Loch Ness Monster, the Jersey Devil or Chupacabra. Somehow you have landed yourself smack dab in the middle of feud between Bigfoot and Yeti so it's time to choose your side as it will help shape the fate of your research and ultimately your success!